Online Reputation management is a very common term used by SEO experts these days and so I am going to give you a real life example to help you not only understand online reputation management but also enhance your online reputation. When you search on Google for the term Apple, as expected you see everything about the Apple Inc and nothing about the Apple as fruit. A couple points to notice in the screenshot above. 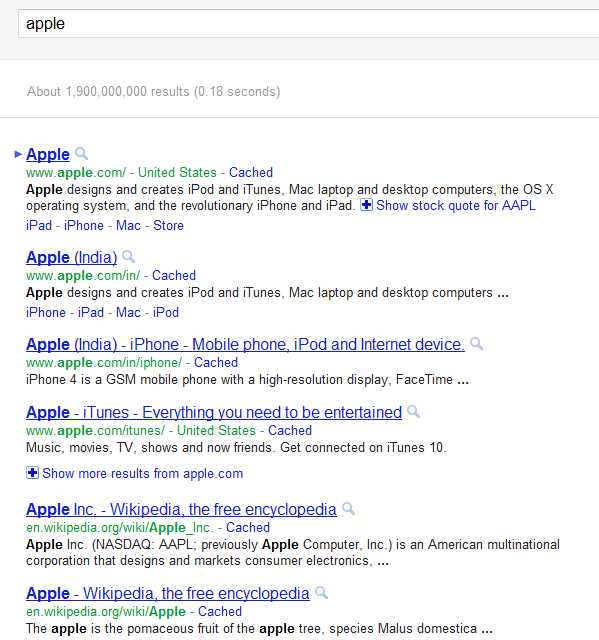 Apple beats Wikipedia for the term Apple. The goal of online reputation management is to suppress the negative mentions (or other mentions) by pushing them lower on search engine results pages and push positive mentions higher on search engine results page to decrease the negative visibility of the person, company, business or brand. 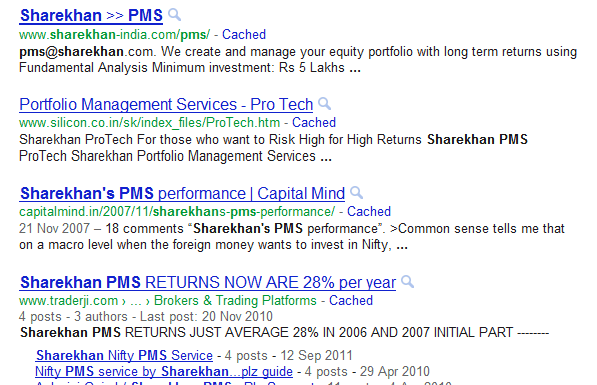 Now the same reputation management effect is happening to my Sharekhan PMS Review. 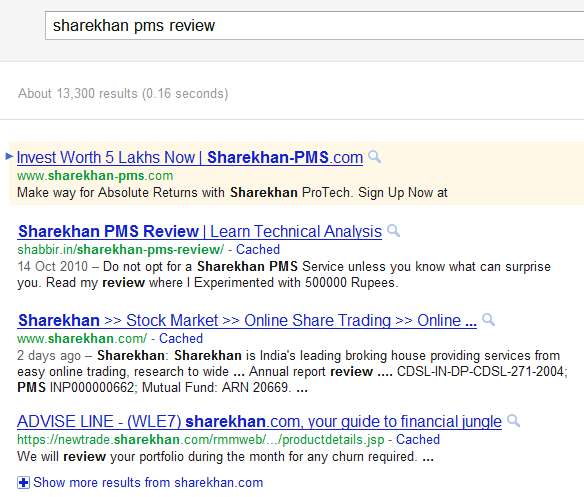 I rank pretty well on Google for the term – Sharekhan PMS review. The answer to the question how I am being pushed down the search engine results page will help understand how you can manage your online reputation. Those domains are not hosted on the same server as the main site but mainly on different shared hosts. Different IPs and different hosts. You can even make whois private if you want. Apart from secondary domains some sub-domains are also created to boost the number of results in the search engine results page. Have some sub-domains for your site that makes sense. Build links to positive reviews that are ranked in search engines but not very highly ranked. Find positive reviews that are on second or third page of search engine results page and try building links to those sites to boost their ranking higher to improve your online reputation. Create keyword-rich content for the authority website in the niche. This content can rank well in Google almost instantly because of the authority of the website. Do you know of other ways to improve online reputation? Please share them in the comments. 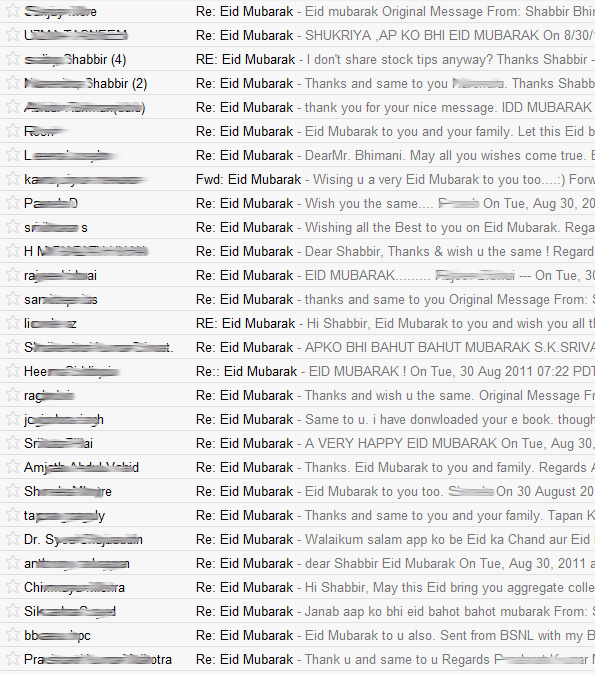 How about the customer Grievances (for eg,. AIRTEL Service Quality) Don’t you think this can be a challenge for a company to keep a good online reputation in this competitive edge? What would be your Call for this kind of companies? Your Recommendations..! I think they will always be there. If you have millions of customer you cannot satisfy all of them all the time. Social media has also really expanded the digital marketing industry and online reputation management. There are a lot of great benefits for businesses to use social media; however there are negatives you have to watch out for. Putting a plan in place ahead of time for how to deal with it can lessen the impact of the attack. you have lots of Knowledge reading online stuffs .